100 Haiku transcends everyday life into an ethereal jigsaw puzzle which forms into individual pieces with jagged edges evolving into a complete and smooth picture when they fit together. Ban’ya Natsuishi and Sayumi Kamakura, create a full portrait out of their personal jagged edges to show that a narrow view of life will cause you to miss what is most important. You can’t have a complete picture with a piece of it gone. You must test every side of the piece of the puzzle. The Haiku of Ban’ya Natsuishi and Sayumi Kamakura are also like a moving train that slows down on each picturesque view and then moves on again after handing you your piece of the puzzle to inspect. Upon inspection there is always a mirror that shows you that all elements are connected. You will find Ban’ya Natsuishi and Sayumi Kamakura, were reading your diaries of your inter-most thoughts and singing your songs in the dead of the night. You will be revealed piece by piece that the jigsaw puzzle is really a tapestry of the soul transforming into threads of destiny. This is masterful writing of the Haiku written by Banya Natsuishi and Sayumi Kamakura. Both are accomplished writers well known in their field of Haiku literature and Poetry and they show why they have prevailed throughout the years with poignant views of life, love and the mysteries of what could be seen outside the mind’s eye. In the 50 Haiku by Ban’ya Natsuishi, voices of both the child and the man show up in each ear through the eye of the reader. He becomes interactive through the visuals of his beautiful Haiku’s. He is the fairy, the Godmother, the Warrior God the believer and the doubter. He in his strength flies like a hawk but breaks like a sparrow when hitting the ground too hard and is instantly back to a child’s innocence. Ban’ya Natsuishi never folds his wings because they are immortal. He always files again and new universes are scanned in when in flight. Ban’ya Natsuishi rides the wind in the past and the future and he can only go to the stars and space in order to show his rough edges of his personal cosmos. Ban’ya Natsuishi returns over and over through the lands and the seas and the skies, through the binoculars of a novice and the perceptions of an ancient wise-man. He through his history of haikus will add his half that will form into an exquisite puzzle to a picture framed in the past, present and future that waits to become eternal. In the 50 Haiku by Sayumi Kamakura , the birth and death of the martyred disciple makes her way through the Haiku that have shaped her books by the intrinsic pieces of her life. You can see the young woman and the old introspective woman putting the excerpts and pieces of her experience together matching each jagged edge of the puzzle to one another. They discuss the colors, the texture, the shapes and what they mean. The young and the old woman have to agree that their wisdom is already perfect. In the mind of Sayumi Kamakura, it is the heart of which designs each jagged edge of the pieces of the puzzle in order to become the more loving and understanding, smooth complete fixture. She sculpts out the Haiku’s which are each visions in their own right with her pen. She teaches when to be aware and when and look in that open terrain. She teaches to see different angles when the window opens to show another view. In 100 Haiku you see the melding of two great writers who have mastered the beauty of the Haiku. Sayumi Kamakura and Ban’ya Natsuishi, ride the train together, looking at the world through the messiah, the human, the animal and the butterfly. Each snap shot of their various perceptions evolve to become an imprint in their Haiku. They bring the obscure to clarity even if they see it differently every time. Innovatively, they each contribute their own special half of the puzzle to become a solid picture. The jagged edges come together forming a beautiful masterpiece which transforms into a tapestry of colors like a silk blanket. Ban’ya Natsuishi and Sayumi Kamakura, complement each- others styles but are also successful in showing contrast in how they relate to the seasons of life. The Tapestry flows and their timeless silk blanket of Haiku becomes thrown upon the Heavens personal possessions covering a brightly lit trunk filled with its favorite Haiku. 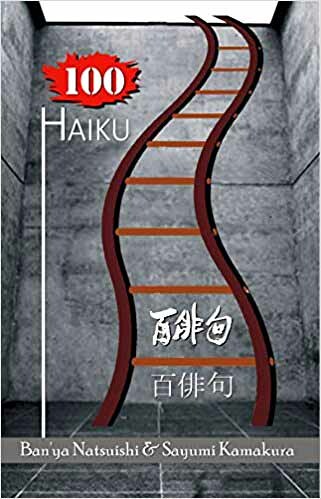 I recommend the book 100 Haiku by Ban’ya Natsuishi and Sayumi Kamakura for the timelessness it gives you so you can stand under the moon, run under the sun, watch the stars and then float down a river. You watch a star falling and then chase it to see where it lands. You may find a rainbow waiting for you. Shirley Bolstok was born and raised in Denver, Colorado. “My parents are Holocaust Survivors. Writing has always been an integral part of my life. I like writing about the shifting of our existence, whether it is ethereal, emotional or physical. I have had many publications of my work including poetry, haiku and quotes in newspapers, anthologies, books and online magazines. I now have three books published, Impassioned Soul, a volume of poetry, Apples From the Tree of Life and Grapes From the Vines of Life. Growing up as a child of Survivors of the Holocaust has given me a very different perspective of humanity from an early age. I have many contrasting views of the windows of life. Each has its own dimension and density. I have a diverse background and education and have appreciated the variety of insights that it has brought me. Time and consciousness are always in motion. We are powerful beings with the ability to create straight from the heart of God.